The previous articles have all led up to now trying to obtain a definitive tissue diagnosis. To recap, after a breast mass is felt, an in-depth exam should then be conducted with your primary care physician. The primary care physician will then likely order a mammogram, ultrasound or MRI to further evaluate your lesion and if you are at or over the age of 40, the mammogram will serve as your yearly screening tool to prevent breast cancer or pick up any lesions early. Up to now, all of the evaluation has been non-invasive and mostly pictures of the mass or area in question. What next? The mammogram, ultrasound or MRI will be reviewed in depth with a radiologist which is a doctor who specializes in reading those studies. He/she will then determine whether or not the area in question needs to biopsied because it either looks benign or worrisome for something more serious such as cancer. Now we need to figure out exactly what this mass is and that is when a biopsy is performed. Biopsy is simply obtaining a piece of the tissue and having it studied to figure out exactly what it is. The cells which are removed are then studied further with a microscope in order to assess the potential threat of breast cancer. The choice of biopsy technique depends on several aspects, such as the size, location, and the number of tumors, existing medical issues, and personal preferences. Below are all the different types of biopsies that can be performed. If the mass is large enough and usually palpable, a core biopsy can be performed. The biopsy can be performed by a specialized breast surgeon that your primary care physician may refer you to or by a radiologist. The core needle biopsy (CNB) uses a large hollow needle to withdraw cylinders (or cores) of tissue from the suspicious area in the breast and is usually performed with the assistance of an ultrasound (Ultrasound Guided Core Biopsy). This requires only local anesthesia while the needle is inserted anywhere between 1 to 4 times. It follows the logic that the more tissue cores checked, the better the sample of the tissue. The procedure can cause bruising, but usually no permanently visible scars. The core biopsy is then sent off to the pathologist to examine under the microscope. While masses that are felt and seen will be treated with a core biopsy, stereotactic biopsy patients are those who usually do not have a discrete mass but have calcifications that are only seen on a mammogram. Because there is no discrete mass that can be felt or seen, microscopic calcifications need the assistance of a mammogram. This procedure is also done with the patient completely awake with local anesthesia to numb the skin. 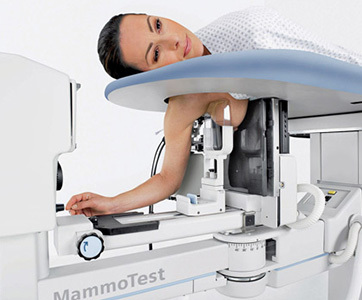 The biopsy is done with the patient lying on their stomach with a machine that has a mammogram, computer and biopsy needle all in one. The mammogram pinpoints the area in questions and then the computer guides the needle to take a core biopsy of the calcifications seen. Multiple core biopsies are performed (10-20) in order to gather a good sampling and also to usually remove all the calcifications that are in question. The biopsy specimens are then sent for microscopic evaluation. 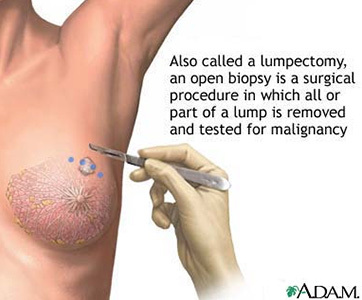 A third option is a surgical or open biopsy, which entails cutting through the breast to take out all or part of the lump for examination. It can be done in the doctor’s office but, more often, is done in the outpatient department under local or general anesthesia. Unlike the first two kinds of biopsies, which make use only of needles, surgical biopsy has an actual surgical incision. Two types fall under surgical biopsy: incisional and excisional. The first one resembles typical surgery with the use of a scalpel to cut through skin and remove a piece of tissue – only a part of the abnormal area – for further analysis. This is rarely done since most masses will be completely taken out except when they are extremely large. 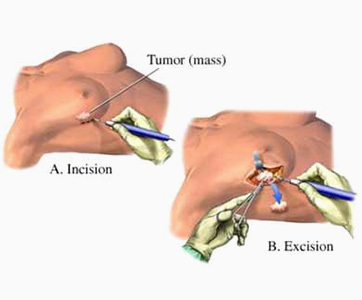 Excisional biopsy involved removing (or excising) the entire tumor or abnormal area. In many cases, the sample taken also includes additional margins or the surrounding breast tissue to ensure that the whole mass is removed. » What do my Biopsy results mean?